So what's in the driveway this week? The 2012 Mazda5. You may instantly be thinking "minivan = bleh." Not the case. 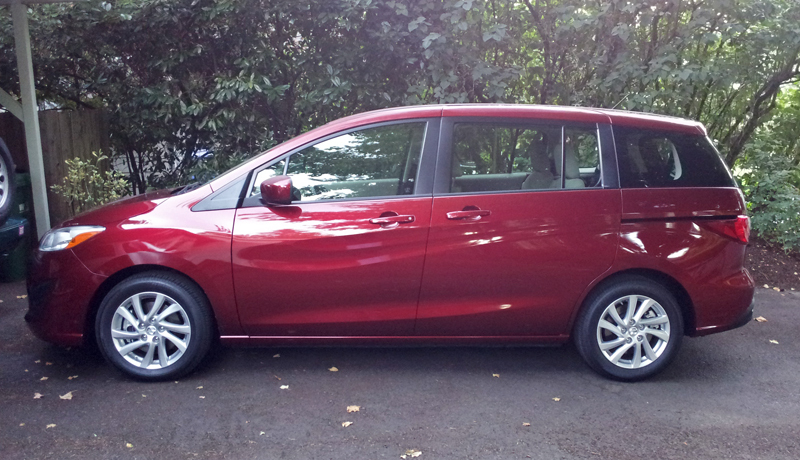 The Mazda5 is more like a stretch Mazda3 with two sliding doors and room for two more people or lots more cargo. Call it a minivan. Call it a wagon. Mazda calls it an MAV (Multi-Activity Vehicle). Call it whatever the hell you want. I call it a breath of fresh air. Why? It has a six-speed manual transmission. Perhaps I'm one of the lunatic fringe that gets all giddy about a car like this offering a shift-it-yourself option, but I can't help it. In fact, I just love the idea of a vehicle like this being offered with a six-speed, and I give Mazda kudos for doing so. Plus, it posesses those wonderful Mazda driving dynamics. Oh yes. Fun-to-drive seven passenger van brimming with paradoxical whimsy. Ok, too much prose. Anyway, initial impressions are very good. A sporting yet comfortable ride, outstanding six-speed manual transmission, and enough guts to make it fun. This vehicle features the Nagare "flow" styling in the sheetmetal that have been met with mixed reaction on this MAV. It's actually growing on me. Can't wait to put some more time in behind the wheel and see if Mazda's miniva ... er ... wago.. er ... seven-passenger Mazda5 is the prefered subcompact culture people mover. Hey, it's the smallest vehicle of its kind offered here, which bodes well for Subcompact Culture! IMO with this car especially they should sell the manual transmission as an anti-distracted driving feature for families with teen drivers or soon-to-be teen drivers. I love seeing these around my work all the time, if I needed a people mover for my everyday car I would get the Mazda5 and mod it throughly. A 6-seater subcompact. Perfect for traveling. I'd rather have a vasectomy than have to drive a minivan again (thanks high school). Hopefully my wife and I don't have any multiple pregnancies.